Enjoy this hearty and homey chicken dish that’s sure to create memories around the dinner table. An hour before you are ready to put the chicken in the oven, remove it from the fridge, rinse with cold water, and allow chicken to come to room temperature. Preheat oven to 475°. Peel and dice sweet potato, onion, beets, and garlic. Chop carrots and parsnips. Mix herbs, salt, and pepper in a small bowl. Combine vegetables in a Dutch oven or roasting pan and toss with olive oil and half of the herb mixture. 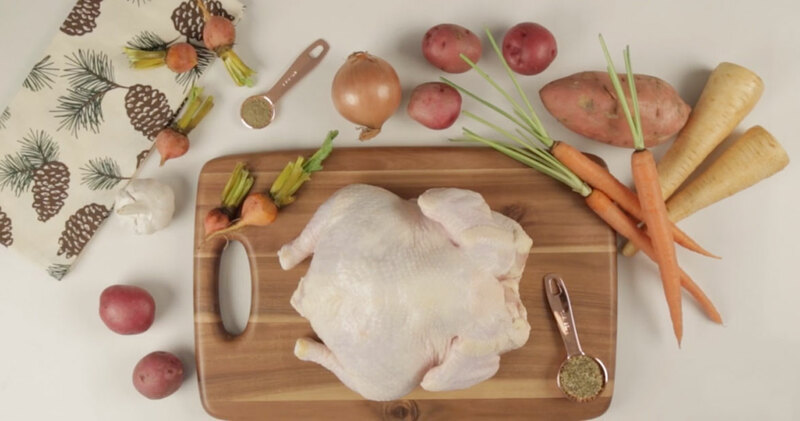 Rub chicken with butter and place on a bed of root vegetables. Season the chicken with the remainder of the herb mixture. Roast at 475° for 20 minutes, then lower temperature to 400°. Cook for an additional 45 minutes, until the internal temperature of the chicken is 185°. Remove the chicken from the oven and let it rest for 10 minutes before slicing and serving.